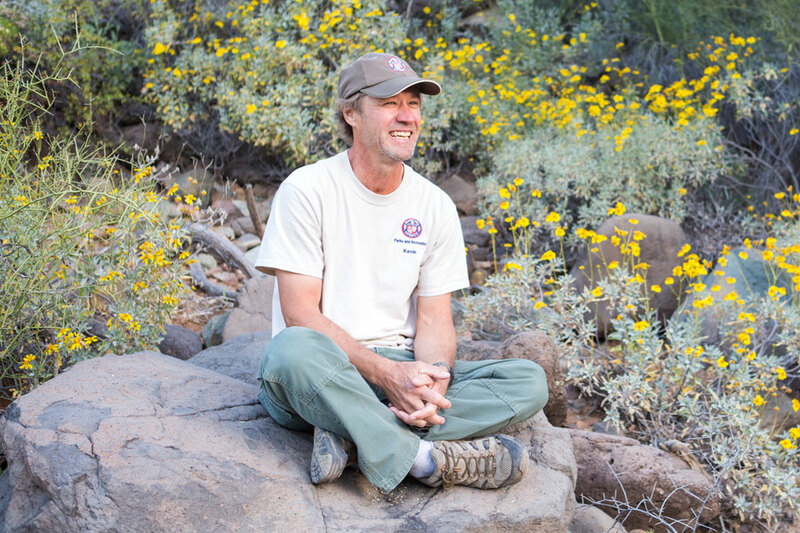 400 species of desert grow in this tiny county park, and ranger Kevin Smith knows (almost) all of them. I fell in love with flowers in Phoenix. Before I moved here, I liked the plastic-wrapped, cut flowers I bought at the grocery store: Gerber daisies, tulips, stargazer lilies. But after seeing brilliant gold Mexican poppies blanketing a mountainous hillside and flaming ocotillo buds reaching for the sky, I crushed on desert wildflowers. Now nothing else compares. And come spring, all you have to do is step onto a trail to encounter fantastical blooms of every color, shape and size. Ranger Kevin Smith’s tousled blonde hair and rugged good looks are straight out of central casting. He’s worked at Cave Creek’s Spur Cross Ranch Conservation Area, part of the Maricopa County Parks and Recreation network, for 10 years. He guides numerous wildflower hikes throughout the spring and summer. Trying to predict how profuse the wildflowers will be or which trail is in bloom when is folly, says Smith. Variables such as temperature and rainfall are just two factors that affect the show. Though it is the smallest of the Maricopa County parks, Spur Cross has documented some 400 wildflower species, making its diversity unrivaled. 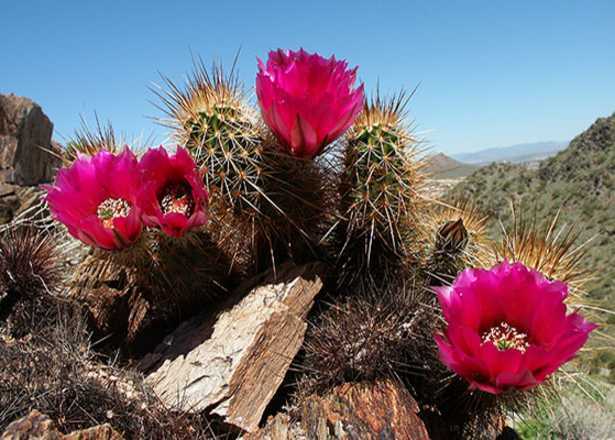 As is typical in the Sonoran Desert, about half the species are annuals. I’ve always thought brittlebush was the first of the flowering shrubs. But Smith corrects me; it’s actually comb bur, an annual with minuscule white flowers and fruit curved like the crescent moon. Rabbits and ground squirrels love it. 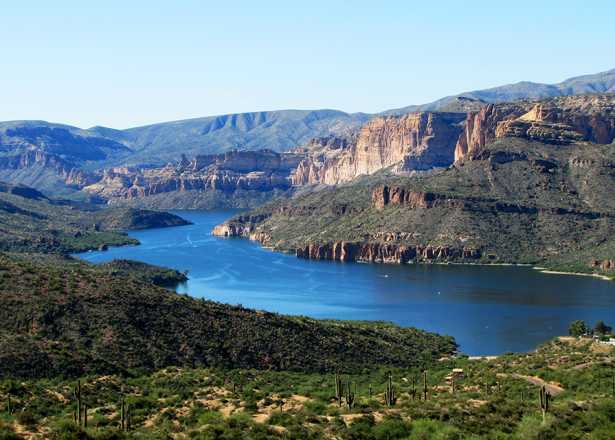 Because the Phoenix area warmed up fast this year, things are progressing quickly. Smith says another two or three soakings between late February and mid April would be fortuitous. It’s early morning and we’re walking along the creek bottom on the Dragonfly Trail, a lush riparian area with sandy soil. Smith points out desert marigolds (their yellow heads blowing in the breeze), white desert tobacco, wispy red fairy dusters and the elegant blooms of sacred datura, which will close in the heat of the day, then reopen in the evening hours. I also spot cheery orange globe mallow. “It’s like Grand Central Station right now,” says Smith of the energetic hummers. I ask which flowers attract the most pollinators, specifically butterflies. “Butterflies love buckwheat, sweet bush and desert lavender, which grow in the washes,” Smith says. During these hikes, Smith likes to point out how both animals and native people used plants for food and medicine. At Spur Cross, mule deer, fish, frog and lizard sightings are frequent. In mid March, Smith sends people toward Elephant Mountain to see purple lupines and scorpion weed. I love the neon, almost lurid, pinks, reds, yellows and oranges of cactus flowers. Many are easy to spot against the desert backdrop, but I like to peek under buckhorn cholla and brittlebush for the flash of tantalizing pink blossoms that encircle the tiny pincushion cactus. They bloom in response to rain. I ask Smith if he has a favorite flower. He considers the question and takes a beat to answer it. I nod in agreement. Picking a favorite is impossible. “And May is fantastic because the ironwood and palo verde bloom,” he adds. Smith posts wonderful photos to the Spur Cross Facebook page. I ask him if he has any tips for amateurs looking to capture a great image with a smartphone. As we wrap up our time on the trail, I ask for two more recommendations: a good guidebook and website to help me identify what I’m seeing. Because every season and every trail offers something new. Smith departs, but I linger. Because my love affair with desert flowers is enduring. 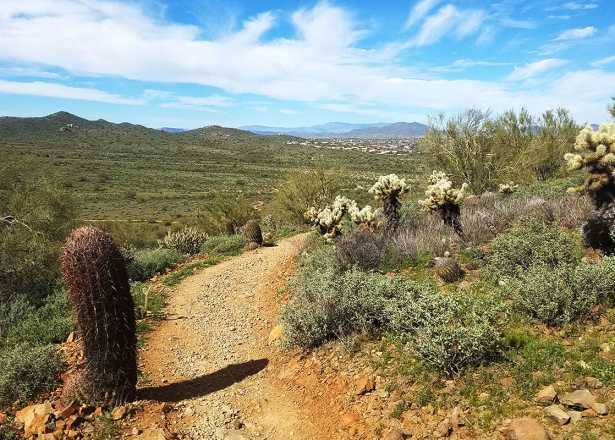 The Maricopa County Parks and Recreation Department offers guided wildflower walks and hikes at Spur Cross Ranch Conservation Area and many of its other regional parks. 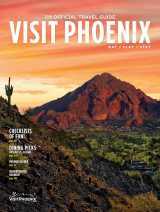 Visit maricopacountyparks.net to learn more. 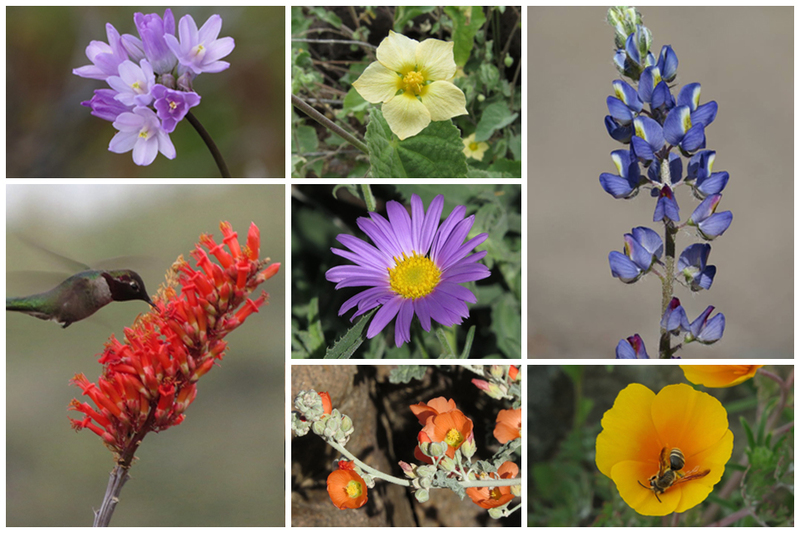 Discover more places to spot beautiful blooms at our Where to See Wildflowers in Phoenix blog post.